I had a conversation with my editor Nate about the waste of food in the United States. I mentioned to him how I find it fascinating when he attends events in the city of Los Angeles surrounded by Hollywood starlets, there can be a large amount of the finest food in that one part of the world. While across the globe someone may not have had a bite to eat in the same day or know where his or her next meal may come from. I bet you on the 4th of July, the day the US gained its independence, the largest amount of hot dogs and buns are consumed at Coney Island in Brooklyn, NY at Nathan’s Famous Fourth of July Hot Dog Eating Contest. 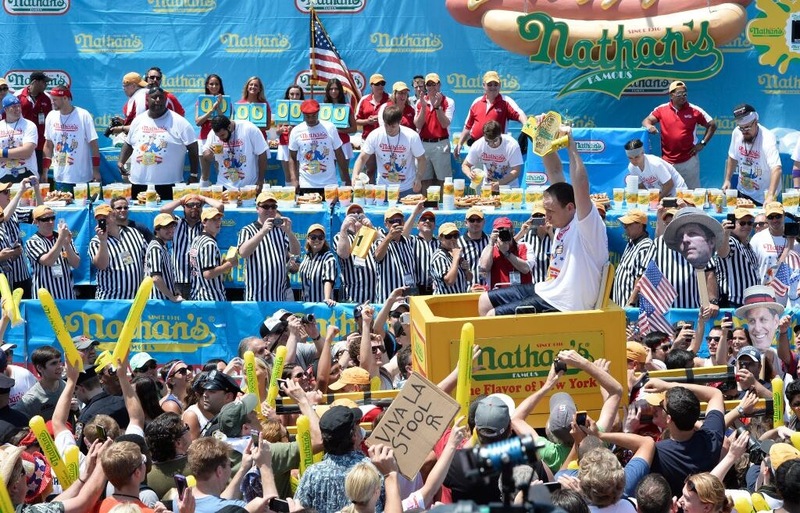 This year marked the 98th annual hot dog eating contest. Joey “Jaws” Chestnut devoured 61 hot dogs and buns in 10 minutes to keep his “mustard-yellow” belt and win his eighth consecutive championship. He barely chewed away Matt “Megatoad” Stonie in the process. Chestnut was dripping in “swagu” before the eating even began. The 30-year-old dropped to his knee on the event stage, just steps from the beach, and “put a ring on it”, proposing to longtime girlfriend and fellow competitive eater Neslie Ricasa, who said yes. That was the opening act, the headliner began with sauerkraut as the topping in the opening 10 minutes. Stonie had the early lead then Chestnut started to eat double hot dogs as he gave chase while Tim “Eater X” Janus was third with seven minutes to eat. Halfway at the five-minute mark, Stonie had a two-dog lead on Chestnut while Janus remained in third with 28 hot dogs and buns scarfed. With less than four minutes to eat, Chestnut and Stonie were tied at 44 while Janus was falling behind with 32 nutrient-filled hot dogs and buns eaten. With one minute remaining, Chestnut came into championship form pulling away with 61 hot dogs in his digestive track over Stonie’s 56 and Janus’ 44. Entering the contest Chestnut’s margin of victory improved every year he had won since 2007, including winning by a margin of 18 Nathan’s franks last year. He put up a fight today. “I knew he was close, this kid is fast, these hot dogs were slow today, the weather was slowing everything down, I could not find my rhythm,” Chestnut stated. 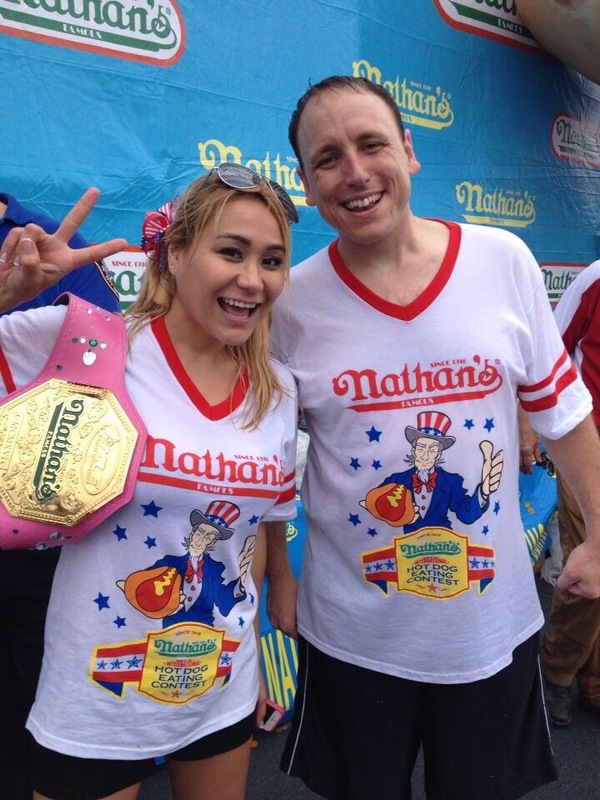 “It was a dog fight today the entire time.” Chestnut holds and set the record last year on Independence Day with a record 69 franks and buns. When it comes to competitive eating, Chestnut came in eating everything in sight. He notably dethroned the six-time champion Japanese competitive eater Takeru Kobayashi in 2007 before losing to Kobayashi two years in a row. “He’s an awesome eater, he might beat me once in a while but not on the 4th of July, I told him that to his face,” Chestnut said. Kobayashi had held the record with six consecutive wins, but in 2010, he refused to sign an exclusive contract with Major League Eating, the food equivalent of the NFL, and was banned from competition. This year, Kobayashi will compete against five other competitive eaters at a separate event on Fifth Avenue in New York City in a quest to down the most hot dogs without buns in 10 minutes. Women enjoy eating hotdogs at Surf and Stillwell Avenue in Coney Island too. There was a new women’s champion as Miki Sudo raised the “pink belt” for the first time dethroning three-time defending champion Sonya “The Black Widow” Thomas by vacuuming up 34 franks and buns in 10 minutes. The 46-year-old Thomas, a native of South Korea who now lives in Alexandria, Virginia, was able to devour only 27 3/4 hot dogs and buns. She scarfed down a record 45 dogs and buns last year. I learned a large amount covering this competition. Some sports records are untouchable. Chestnut holds 32 world records. Notable ones include eating 121 Twinkies in six minutes, 70 bratwursts in 10 minutes, 15 pints of vanilla ice cream in six minutes, 62 pulled pork sliders in 10 minutes and my favorite 141 hard-boiled eggs in eight minutes. There is even a science to the use of water; keep in mind there are areas in the world where clean water is scarce. Dunking in the water takes air out of the bread and it is like taking a drink of water washing the food down when wet. Chestnut prefers his water warm. Sudo the new women’s champion prefers dunking in lemonade. Lastly there is an official weigh-in before the competition for both men and women. The average American eats only 70 hot dogs per year, nine more hot dogs than what Chestnut put away in 10 minutes. The 61 hot dogs and buns equates to 23,790 calories, 1,189.5 grams of fat, 60,390 milligrams of sodium, 2,245 grams of carbohydrates and 793 grams of protein. The patriotic thing to do on the 4th is have a weigh-in after.